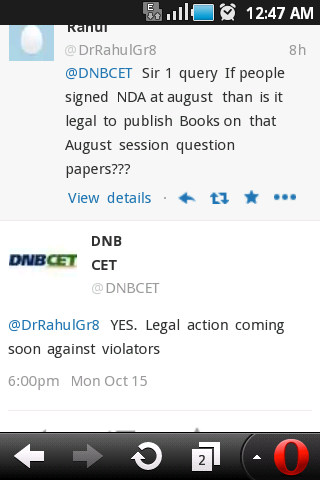 Tweeting about NDA (Non disclosure agreement) NBE on its twitter account www.twitter.com/DNBCET said that sharing questions in any way may attract legal actions and such act is a punishable offence. 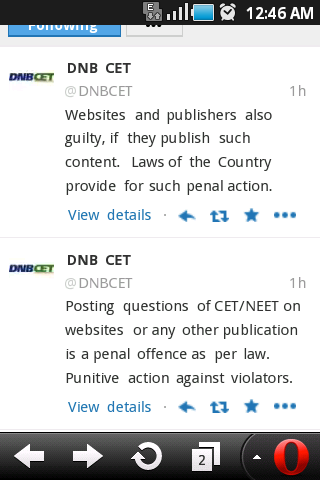 NBE also says that the websites and publishers who publish these contents will also be considered as violators and may be looking forward to legal actions. On this issues some students are in the opinion of using RTI act, that the memory based questions belong to the students. But i advice all the students (PG aspirants) at least not to share the questions openly in public forums, which may jeopardize your chances of getting a PG seat. Post your views in the comment box and let us know what you think.